In Star Wars Episode 1: the Phantom Menace, there existed a ruthless assassin by the name of Darth Maul (above, left). Mentored by the evil Darth Sidious and powered by the dark side, Maul, for me, was the most malevolent force – and face – in the Star Wars universe. 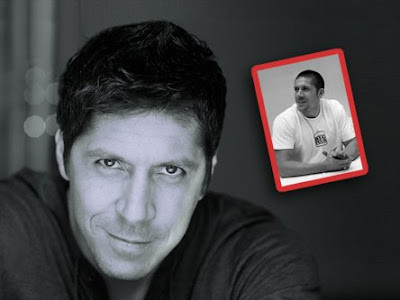 So who would think that the guy who played him – Ray Park – actually looks like this (below)? He may appear charming and friendly, but mind you, he and Darth Maul have a lot in common. Like the deadly Maul, Ray started combat training at a very young age. When he was only seven years old, Glasgow-born Parks trained in Northern Shaolin Kung-Fu. At sixteen, he was the United Kingdom's Martial Arts National Champion. In the 1993 World Wushu Games in Malaysia, he competed as a member of the British Wushu Team. Like Darth Maul, Ray was trained to kill. But unlike his sinister Star Wars character, Ray will play the 'good guy' very soon – as the mysterious hero Snake Eyes in the forthcoming movie, G.I. Joe: Rise of Cobra. I will announce the raffle winner in my next blog entry. 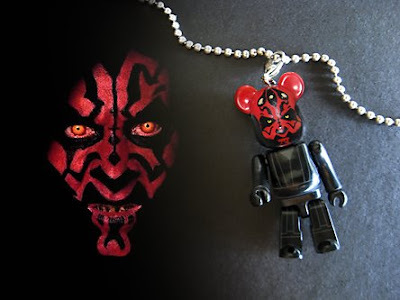 The winner should email me his/her postal address so I can send the Darth Maul bearbrick to him/her by registered airmail – absolutely FREE! Simple, isn't it? hi! thanks for posting my bape. wanna join the raffle! Hi! I am John. For raffle..
Hi, I wanna join the raffle. hi Im wade - From Sydney Australia.. adding my name for the raffle! hi i have 3 bearbricks. i'm 6 years old. i live in sydney australia! hi, i'm turning 5 on august 7!